A feis (pronounced fesh) is the name for an Irish dance competition. 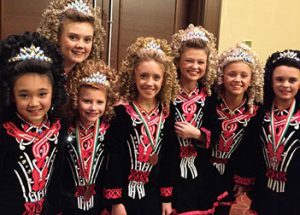 OGQ is registered with An Coimisiun le Rince Gaelacha (CLRG), and therefore all of our dancers must compete with feiseanna that are registered with the North American Feis Commission (NAFC) or CLRG. Where can I find information on local feisanna? How do I know if my dancer is ready to feis? You must check with your teacher before signing up for your first feis. They will know what dances your child is ready to compete in. Keep in touch with your teacher as your dancer progresses and they will continuously let you know when to move your dancer up a level or to add dances. How do I sign up for a feis? First you must read through the syllabus of the feis you would like to attend. Make sure they are still taking entries and when the entries are due. Remember to allow plenty of time to sign up. They tend to reach their cap and close early. Figure out how old your dancer is as of Jan 1st of this year. If your dancer is 9 as of Jan 1st then your dancer will compete in Under 10 all year long regardless of when they turn 10. Figure out the level your dancer will be competing in and the dances your dancer is performing. Once you have figured that out, you will need to see if the feis does online entries, mail in entries or both. If both you can choose whatever you prefer. Online entries will require you to sign up on a particular website and enter via that website. Payment options may be online or mail in. Make sure to read the instructions. Mail in entries will require you to write the following and send it in with your check. Fees can vary from feis to feis. If you have additional questions, please use our contact form to email us.